Le Claire City Hall is located at 325 Wisconsin Street, Le Clare, IA 52753; phone: 563-289-4242. Photo: McCaffrey House, ca. 1870, 208 N. Cody Road, Le Clair, IA. Part of the National Register thematic resource nomination, Houses of Mississippi River Men, 1979. Photographed by User:Kepper66 (own work), 2011, [cc-by-3.0 (creativecommons.org/licenses/by/3.0)], via Wikimedia Commons, accessed August, 2013. Le Claire was formerly 3 separate villages, Le Claire, Parkersburg and Middletown. All three were incorporated under the name Le Claire, in honor of Antoine Le Claire, pioneer benefactor of the county and founder of Davenport. Le Claire was the boyhood home of William F. (Buffalo Bull) Cody. Isaac Cody, father of Buffalo Bill, was a pioneer settler of Scott County. William, one of five children, was born February 26, 1846, on what was then known as the John S. Wilson farm, 1-1/2 miles north of Le Claire. Later the Cody family moved to a village house. Le Claire was also the home of Captain James Buchanan Eads, an engineer, who among other accomplishments, opened the mouth of the Mississippi River to permit vessels to enter, and erected at St. Louis the bridge bearing his name. 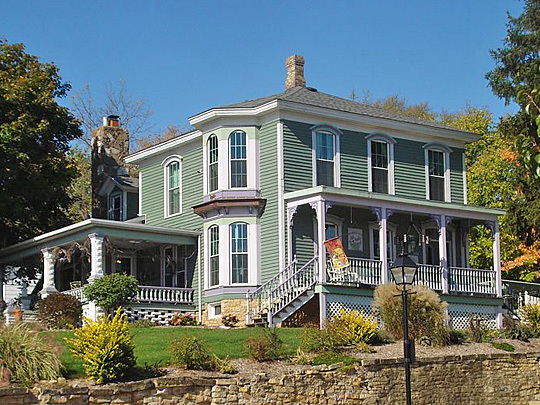 Captain Ead's father, Thomas Eads, in 1836, built the first frame house in Le Claire. Having invented a diving bell, he formed a partnership in 1843 for salvaging shipping from the river.